Trek frames are synonymous with quality and their faith in the product is backed up by life time warranty. 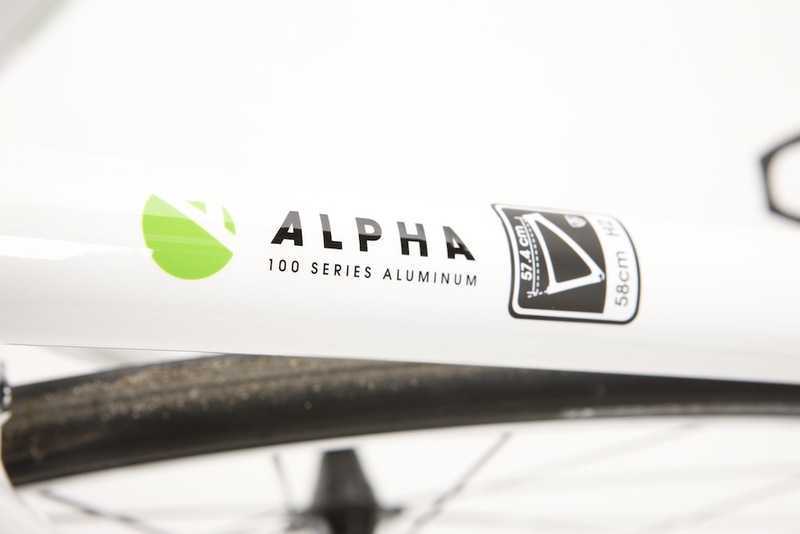 The frame is Trek’s top drawer ‘Alpha aluminium’ whilst the fork is carbon fibre. In order to test the Trek 1.5 we have been riding it throughout winter, on commutes and longer training rides. The One series is Trek’s base level frame and would potentially suit a large number of cyclists. If you are in the market for your first road bike, a dependable winter bike, or just something for epic sportives that won’t break the bank, the Trek 1.5 is a great option. 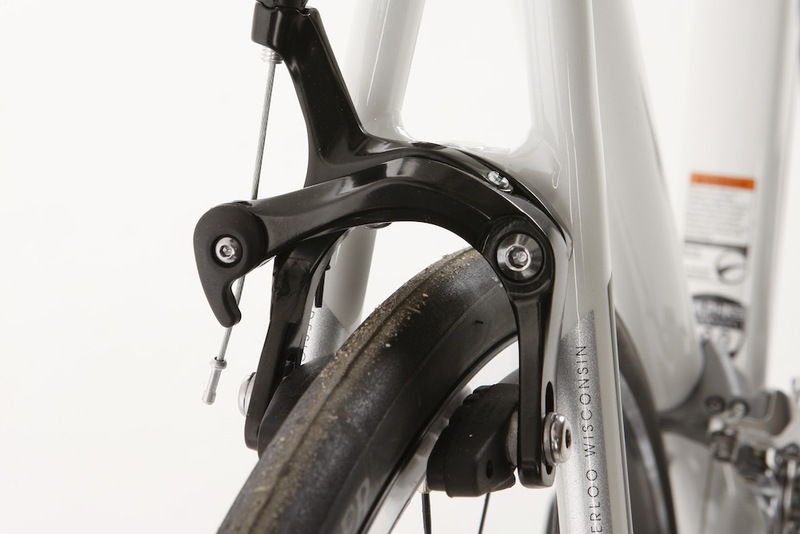 Hinting at this versatility is the inclusion of eyelets on the stays and forks, to aid the fitting of mudguards. There is also loads of mudguard/tyre clearance under the brakes. But, if you are flexible, or have good core strength you may find the upright posture this bike encourages limiting when you want to get lower and more aero. The geometry of the Trek 1.5 is relaxed. For those new to cycling, this means that the horizontal reach from the saddle to the handle bars is shorter and the vertical height of the handle bars is higher. Rather than a super aggressive flat back like Bradley Wiggins, this enables the rider to sit more upright, in a more relaxed position. This makes it ideal for new riders, who are yet to develop the core strength and flexibility that makes an aggressive position more sustainable. Our 58cm test model came with 44cm bars, which although less aerodynamic than a narrower bar, they may help add stability to overall handling to less confident riders. 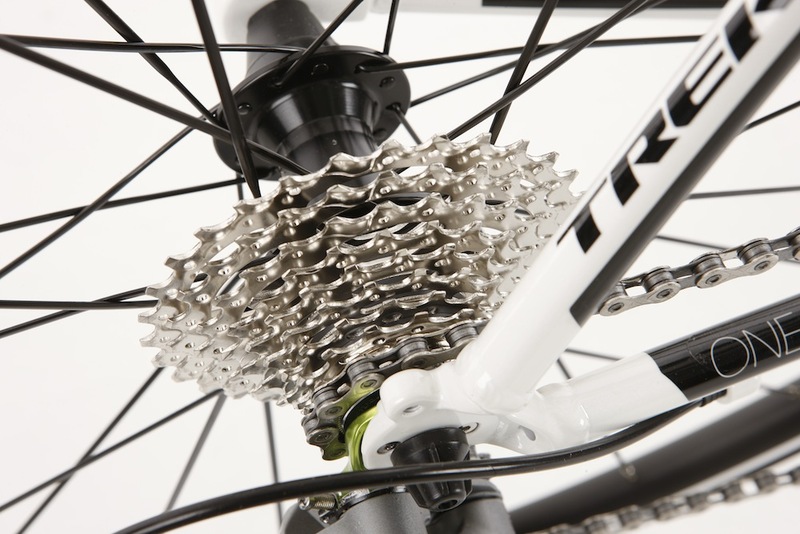 The Trek 1.5 comes fitted with a range of components. The shifters and derailleurs are Shimano Tiagra, but the chain set is FSA Vera and the brakes are unbranded callipers. We were hugely impressed with the quality of the shifting on this bike. The FSA chainset works well in this regard with little or no flex, to hamper shifts. We felt that the brakes let the bike down. The unbranded callipers didn’t feel as responsive or stable as a Tiagra or Shimano 105 calliper. The lack of strength translates to less braking power and compromised modulation. That considered, the first thing we would upgrade on this bike would be the brakes. This is disappointing when we consider the overall price. 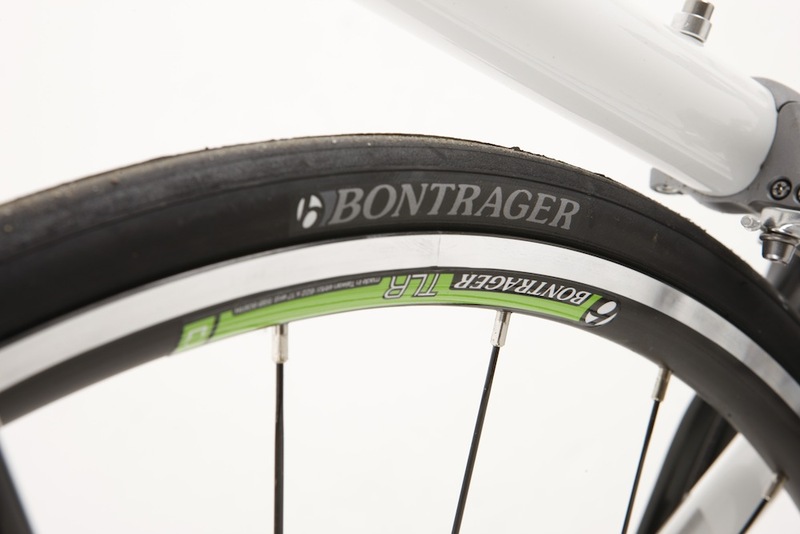 Our test model featured 23mm Bontrager R1 tyres. These rolled nicely and were puncture free for over a few weeks of winter riding and commuting on roads strewn with potential puncture hazards. We would have preferred to see this bike come fitted with 25mm tyres as they are stronger and can aid comfort. We do however like that Trek have equipped the bike with tubeless ready rims. Using tubeless tyres could reduce the risk of punctures. The Tiagra rear cassette is 12-30t. With professionals even adopting 32t cassettes on steep mountainous days, it would be nicer if the Trek came with either a 12-32t cassette or a medium length cage rear derailleur, which would allow a 32t cassette to be fitted. Being a short cage derailleur, it is designed to only go up to 30t. This is in contrast to other bikes in a similar price range, such as the Giant Defy 3 and B’Twin Alur, which both have 32t cassettes as standard. Our favourite thing about the Trek 1.5 is the ride handling. 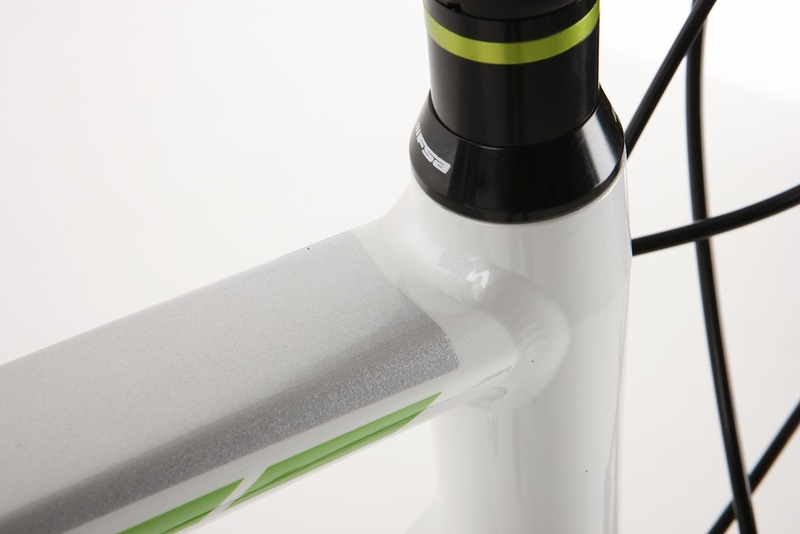 Use of round tubes helps contribute to stiffness, whilst the carbon fork offers some dampening. The ride is very smooth, with the frame doing an excellent job of ironing out imperfections and bumps. Considering how well the frame absorbs road buzz we were pleasantly surprised to find that the bike is no slouch when you want to accelerate out the saddle either. Compliant frames can often feel spongy when you give it the beans, but the Trek 1.5 quickly gets up to speed without any fuss. Wheels on bikes in this price range can often be bargain basement, with spokes that feel as if they are made of cooked spaghetti, but we were pleasantly surprised by the Bontrager wheels on this bike. They compliment the frame well and don’t sacrifice ride quality. Overall, the bike feels nicely balanced, with the weight centred. This is noticeable when riding uphill or track standing. Our 58cm test weighed in at a respectable 8.7kg without pedals. Cornering can feel a little tame, but will always be the case when a bike has a high front end. A lower front end enables you to lower your centre of gravity to a greater degree. Whilst colour is subjective, we feel the Trek is rather boring to look at. 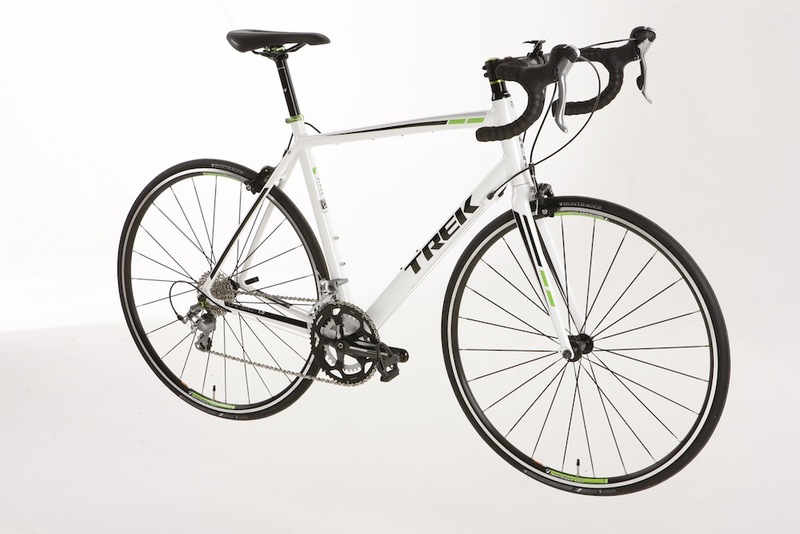 The first thing that draws your eye to a bike is the way it looks and the Trek looks pretty utilitarian. Don’t expect to cop admiring glances at the cafe stop. That said, plenty of us value function over form. For more information, head over to Trek. If you are looking for a first road bike or solid winter steed, this is a quality frame that will last the course and not let you down. The geometry is very relaxed, with this bike better suited to all day comfort and less flexible riders. The ride is smooth, but the brakes and a couple of other minor details let the overall package down when we consider the price.